Robin Youngs, Edward Fisher,	The Journal of Laryngology & Otology, Volume 127 Issue 6, p 535. M S Gonçalves, A F Silveira, A R Teixeira, M A Hyppolito,	The Journal of Laryngology & Otology, Volume 127 Issue 6, pp 536-541. L Louw,	The Journal of Laryngology & Otology, Volume 127 Issue 6, pp 542-549. D W Eisele, J D Richmon,	The Journal of Laryngology & Otology, Volume 127 Issue 6, pp 550-555. Are UK otorhinolaryngologists maintaining their research output? K Kulkarni, M Kulkarni, J Ramsden, P Silva,	The Journal of Laryngology & Otology, Volume 127 Issue 6, pp 556-561. S Ahmed, N Raza, S Ullah, A Shabbir,	The Journal of Laryngology & Otology, Volume 127 Issue 6, pp 562-567. C H Hahn, S E Stangerup, P Caye-Thomasen,	The Journal of Laryngology & Otology, Volume 127 Issue 6, pp 568-573. G J Watson, G Trainor, A E Camilleri,	The Journal of Laryngology & Otology, Volume 127 Issue 6, pp 574-577. F Zhang, Y Sha,	The Journal of Laryngology & Otology, Volume 127 Issue 6, pp 578-583. 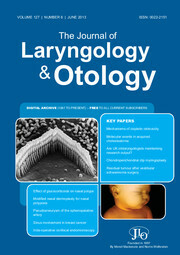 T Bülbül, Ö Gümüştekin Bülbül, O Güçlü, A Serpil Bilsel, S Önal Gürsan,	The Journal of Laryngology & Otology, Volume 127 Issue 6, pp 584-589. T J Beech, G Campbell, A L McDermott, A J Batch,	The Journal of Laryngology & Otology, Volume 127 Issue 6, pp 590-594. G Anastasopoulos, G Grigoriadis, S Papoutsi,	The Journal of Laryngology & Otology, Volume 127 Issue 6, pp 595-598. T Just, H W Pau,	The Journal of Laryngology & Otology, Volume 127 Issue 6, pp 599-604. F Brigo, M Storti, P Lochner, R Nardone,	The Journal of Laryngology & Otology, Volume 127 Issue 6, pp 605-606. C C Chan, M S Kermanshahi, B Mathew, R J England,	The Journal of Laryngology & Otology, Volume 127 Issue 6, pp 607-609. Y-W Kim, M-J Baek, H-D Kim, K-S Cho,	The Journal of Laryngology & Otology, Volume 127 Issue 6, pp 610-613. Y W Kim, M-J Baek, K H Jung, S K Park,	The Journal of Laryngology & Otology, Volume 127 Issue 6, pp 614-618. D T Walker, S Barbur, R Mathew, J Hern,	The Journal of Laryngology & Otology, Volume 127 Issue 6, pp 619-620. W F Mourad, K S Hu, R A Shourbaji, L B Harrison,	The Journal of Laryngology & Otology, Volume 127 Issue 6, pp 621-624. A G Gordon,	The Journal of Laryngology & Otology, Volume 127 Issue 6, pp 625-626. Y M Bhatt, J P De Carpentier,	The Journal of Laryngology & Otology, Volume 127 Issue 6, p 627. The Journal of Laryngology & Otology, Volume 127 Issue 6, pp -.